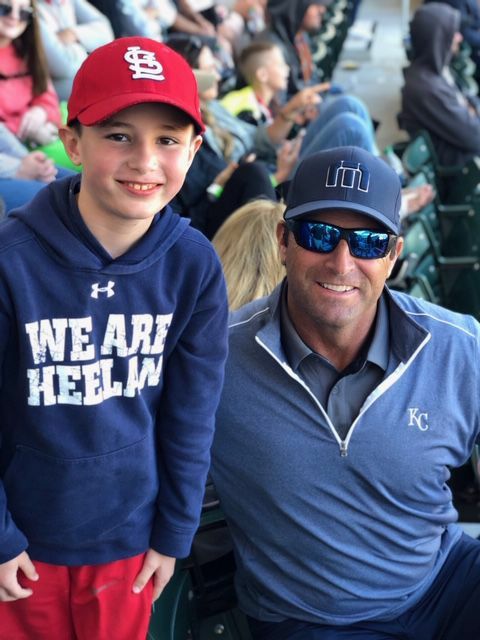 Jim Wharton's grandson, Cal Giese, and Mike Matheny, former manager of the St. Louis Cardinals, pose for a photo at a Major League Baseball spring training game in Florida earlier this year. I am often asked how my “career” in Major League Baseball is going. Let me bring new Journal readers up to snuff. Last winter, I nailed a position with the Minnesota Twins at their spring training facility in Fort Myers, Florida. Great baseball minds like Hank Krause in Akron and Boyd Pitkin at Briar Cliff aren’t the least bit surprised I wiggled my way into a baseball gig. Ah, but there were some challenges. The Twins gave me a name badge that said, “Jim from Minnesota” and a shirt that was two sizes too small. The job paid $8.25 an hour. I was an on-call employee which meant I would fill in when there was a need. I worked three games and received a W-2 from the Twins for $78. There’s progress to report. My 2019 nametag read “Jim from Iowa” and my powder blue Twins shirt fit perfectly. They bumped my pay to $8.50 an hour. I worked a total of five games and turned down at least six other opportunities because of conflicts. But here’s the rub. I’m still planted at Gate 2 and haven’t seen a single pitch in two seasons. I define my role as “security,” a.k.a. bag checker. I poked my nose in purses, backpacks, diaper bags and fanny packs (old folks still use them) on the lookout for contraband. That could range from a pocket knife to a bag of peanuts. I just couldn’t bust a 4-year old boy toting Apple Jacks and a Gatorade. I’d wink at mom and dad and let them pass. My job performance was probably less than satisfactory. • Artificial knees and hips are all the rage. • Pacemakers are becoming more prevalent. • There are lots of St. Louis Cardinal fans wherever you go. • Cub fans are geographically-challenged. This is Florida. The Baby Bears are in Arizona. • One grumpy fan complained about ballpark security, suggesting it was like going to the White House. I corrected him. It’s easier to get into the White House than it is Hammond Stadium. He was not smiling. I was ecstatic when I confiscated his can of Pringles. Boom. • One lady asked where I was from in Iowa and when I told her Sioux City she asked if I was a politician. Turns out she voted for me in 1989. In an unrelated move, she now resides in Minnesota. • Minnesotans are tough. Some of them asked how the Twins could hire an Iowan. I told them it was easy – they paid me double what they paid a Minnesotan. Ouch. The highlight of the winter happened in early March when our daughter Laura, son-in-law Bobby and their four children flew to Fort Myers for a quick break. My grandson Cal loves baseball like his grandpa and we always hit at least one spring training game. This year we saw the Red Sox play the Pirates. The game was secondary to what happened in the stands. In the row right in front of us was Mike Matheny, the former manager of the Cardinals. His son Tate is a Red Sox minor leaguer. Even though he was fired by the Redbirds last season, Matheny was kind enough to sign Cal’s Cardinal hat. An inning later we noticed that another former Cardinal manager and current Red Sox executive, Tony LaRussa, was seated just below us. Between innings, Cal and I went down, and Cal asked LaRussa to sign his ball. Tony signed and even posed for a picture. After a few innings we thought we’d ask Matheny to sign the same ball that LaRussa had signed. His response surprised us. “Cal, I don’t think you want me to sign that ball. Tony is a Hall of Famer and I’m not.” Now that’s classy. In the spirit of transparency, I was one of those fans who thought the Cardinals needed to make a managerial change last year. After having had the opportunity to meet Mike Matheny I have to say he was nothing but professional. When we left around the eighth inning we all thanked him for his kindness, and he made sure to tell Cal – “to keep on playing." That’s the way you build support for the game. Thank you to Mike Matheny and Hall of Famer Tony LaRussa for giving a young boy and an old boy a memory that will last a lifetime. Jim Wharton, of Sioux City, is a former member of the Sioux City Council and a former mayor of Sioux City. He and his wife, Beverly, have one daughter, Dr. Laura Giese, and four grandchildren. Several ballplayers from Sioux City are inching closer to big league debuts with strong play in the minors.